News and Pebble Blog - Landscape & Outdoor Furniture - Ready for Summer Sale on now! Ready for Summer Sale on now! The rock&stone 'Ready for Summer' sale is on now. 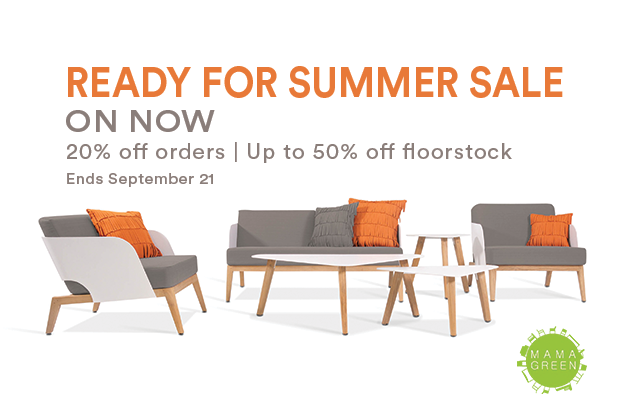 With up to 20% off orders and up to an incredible 50% off floor stock, you'll need to get in fast. The sale ends on the 21st of September, and there are so many MAMAGREEN ranges available to choose from. Whilst our floor and warehouse stock may meet your needs, you may also wish to order specific sizes, colours or finishes. We hope to see you at our showroom on 33 Tooronga Road, Malvern East.